Fishing vs Money: How Much To Spend On Your Fishing Hobby? There is no denying it. Fishing gets more expensive every year. As a child, growing up in the 1970’s, there really was not a lot of tackle that you could spend your money on if you liked to fish. Many of the fishing rods were made from fiberglass which aided in keeping them inexpensive and the reels were not nearly as sophisticated as they are today. You could always buy spinners and other lures but there were no large box stores that stocked row after row of fishing tackle. 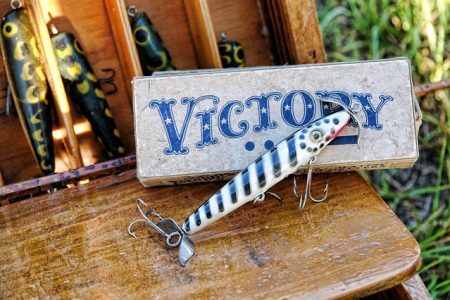 Most of our lures came from the small fishing departments in hardware stores or some of the larger retailers, if you were fortunate enough to live close to one. Today, fishing is big business. In 2011, the average fisherman spent $1,261.00 on fishing supplies and fishing related purchases. Combined, this came out to over $15 billion dollars in industry terms. In fact, only the hobbies of running and biking have more participants than fishing. While it is true that most men and women who regularly fish are older than the participants of other sports, this age difference could be simply because it is one sport that older people are able to participate in for a longer period of time. This all equates to a lot of companies competing with each other in order to get their slice of this very large pie. 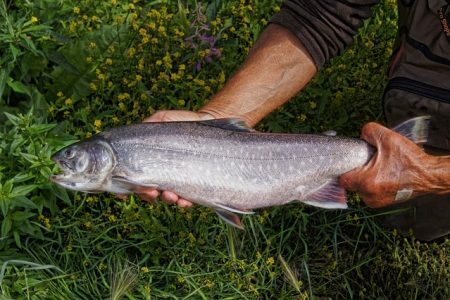 A few years ago, I picked up my first fly rod and in spite of my fear that I might be adopting yet another hobby that would demand more of my limited, discretionary income, I was determined to give it a try. I suppose all of the images from magazines and television shows were floating around in my head and just in case the whole process of learning a new way to fish wasn’t intimidating enough, all of the expenses that must surely accompany such a sport proved even more frightening. You know what I’m talking about. ‘That Guy’ in the stream, with the expensive waders and the state of the art rod and reel, must have surely spent a fortune. In addition to that, there are all of the gadgets hanging from his body that could only add to the cost, nets, flies, wading staffs, and the list goes on. Regardless, I took the plunge, knowing that I was only getting older and not younger. I purchased a very reasonable rod and reel, picked out a handful of flies and began my journey. I learned to cast, though some might say that I still haven’t figured it out, by watching youtube videos and reading books. I then journeyed down to the river for the first time to try my hand at fly-fishing for smallmouth bass which dominates my geographical area. After easily catching a few, I was hooked (no pun intended). I also realized, after a few more trips, that I had yet to spend any additional money on my new hobby. What a novelty compared to the other forms of fishing! The same flies that I had started with actually worked all year, in all conditions, and in any body of water. What’s more, they lasted longer than most spin cast lures simply because I got them snagged less often! It’s unfortunate that most new anglers are taught to fish with a spin cast reel as I was. Certainly, it is easier, but it is also more expensive and the truth is that children learn new things easier than adults. You see, children don’t know that something is supposed to be difficult unless someone tells them that it is. They simply have no frame of reference for comparison and as such, accept everything at face value. Not that fly-fishing is difficult, because it truly is not, but that is undoubtedly why we instinctively believe that children should be taught to use spin cast gear instead of being taught to fly-fish, and we unintentionally throw them into that pool of competing companies who will try to wow them with the greatest lure and the most sensitive rod in endless attempts to get their money. Now I will try to make my case to you that fly-fishing is the most economical form of fishing that you can do, with the exception of a cane pole and a can of worms. Although a cane pole might be cheaper, it is not nearly as adaptable to different species of fish and conditions, like a fly-rod is. At its core, a fly rod is designed for one thing and one thing only. It casts a line. That’s it. When you hook-up, it also provides a built-in shock absorber for fighting the fish but this is simply a side benefit to the design that is necessary for it to fling line out in front of you. Even the most modestly priced fly rod will do these two functions well. Speaking purely for myself, I refuse to spend a lot of money on any fly rod. I own several, none of which are more expensive than a spin cast rod, and they have never broken. Not even by accident. In fact, the darn things are nearly indestructible. Unless you are after a lifetime guarantee, which many of the medium and higher priced rods will provide, there is no reason to break the bank on a fly rod. More often than not, all you are getting is an aesthetically attractive rod that will not catch any more fish than the cheaper ones. Fly-reels, like rods, have only one function in this world of ours. They hold the line. They don’t cast it, or (in most situations) reel it in, they only hold it. It does not matter if it’s machined, space metal or poured aluminum (or even plastic), they all hold the line. Unless you are planning on catching some very large fish, such as saltwater fishing or Steelhead, you do not need to worry about the drag system and how many ball bearings it has. It will still hold the line. I like to spend more on my reels than I do on my rods but I have owned fly reels that range from top of the line to plastic entry levels. I still have every one of them (none have proven inadequate the way a cheap spin cast probably will) and they all still function as they were designed. They hold the line. The truth is that when you catch a fish on a fly rod, you are most likely going to strip it in with your left hand anyway, the reel simply picks up the excessive line lying at your feet. If you hook a really large fish and you are worried that your drag might not be the best, simply use your hand to act as your drag, by placing it against the reel and adding pressure. In fly-fishing you need a leader but the type of leader that you use is up to you. Tippets and tapered leaders can be a little ‘salty’. This is because of the manufacturing process necessary to produce a tapering monofilament line. Do you have to have these to catch fish? In a word, no. You can use straight monofilament line for any fish and it is very reasonable. A spool costing .99 cents will last for weeks of daily fishing. If you take a trip to the western part of the U.S. to fish for trophy rainbows, then go by some tippets. Otherwise, most fish couldn’t care less what the fly is tied to. The argument for using tapered leaders is that they allow the fly to behave more naturally in the current. My response is always the same. Why would I start with a 10 lb leader that tapers to 4 lbs (where I tie on the hook) when I can just use a 4 lb leader? A chain is only as strong as its weakest link and my 4 lb leader will break at the exact same time that your 4 lb tapered leader will. The only thing we haven’t covered are the flies. Flies can be a little pricey if you buy them from a fly shop. They are tied by people working there and they expect to get paid for their efforts. So the key is to get them elsewhere. Amazon sells them by the bundles and so do the large sporting good box stores, though their inventory might be limited. The bottom line in any business forces retailers to stock more spin cast lures than flies, because there is more money to be made from the same amount of shelf space. If you really want to save some money, learn a couple of tying patterns and tie your own flies. Not only will you save cash, you’ll get a kick out of catching fish on something that you made with your own hands and you can tie those flies that work best in your area. You don’t have to do this to keep expenses down though. All you really need for any fish, in any conditions, is a small collection of wooly buggers. They are the spinner of the fly-fishing world and are the most often fished fly because of it. They just work. You can buy them or tie your own. I enjoy tying flies, another thing that I learned by watching internet videos, and when I do they end up costing me about .02 cents each. Compare that to a new crankbait! Because they are so cheap and so easy to make, I literally have more than I can carry on me. Unlike spin cast gear, however, I do not need bags and bags of different tackle for every possible water condition. Just a few of this, and a couple of these, and I’m set for the day. Most of them stay in my basement unless I am fishing unfamiliar water but once you figure out your area and what the fish want, you can literally walk out the door with nothing but your rod and a handful of flies. Most fly-fishing is done while wading or standing on the bank, so a boat is not necessary and neither are waders unless you are fishing in cold water. During the more pleasant season, you can ‘wet-wade’ (yep, a real fly-fishing term!) an activity that requires nothing more than a pair of shorts and old tennis shoes. If you already have a boat then you can certainly fly fish from it as well. I do from mine, and I love the fact that my decks are wide open and not cluttered with tackle bags and 5 spin cast rods. When I was growing up, fishing and hunting were considered the “Poor Man’s Sport”. They still can be, you just have to turn off the competition fishing shows on the television and think outside of the box. The fish are the same as they were one hundred years ago and so is the water. The only thing that has changed is the commercialism and the endless gadgets that have taken over our sport. In spite of your initial impression that the term ‘fly-fishing’ conjures, it really is the working man’s way of catching fish.